With the rise of cost & complexity in the multi rotor world, don't risk your investment in the hopes of a safe flight. 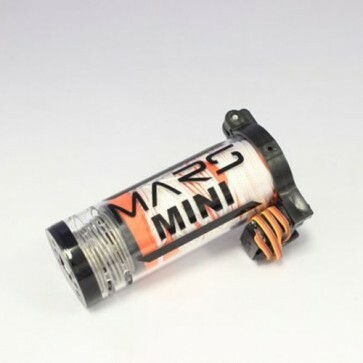 Do it right with the MARS MINI V2, allowing you to fly with confidence and safety by utilizing ballistic parachute technology - the investment that will pay for itself tenfold with the first deployment you make. Light weight, compact and ever so easy to use, the MARS MINI V2 is the 2nd generation of the MINI platform, providing 36" inches of ballistic parachute safety & support. This design capitalizes on the amazing success of the original MINI system, taking advantage of lighter weight materials and greater levels of parachute deployment. Utilizing a high energy compression spring for lightning quick parachute deployment, the MINI V2 was designed for smaller aircraft with a maximum weight of 4 lbs. - absolutely perfect for aircraft like the DJI Phantom, DJI Flamewheel 450, and TBS Discovery. Mature in overall design, the all new V2 boasts lighter weight and a high strength layout, coalesced with an all new vented canister design for rapid deployment of the parachute system. Further this with a compact cylinder and multiple mounting patterns, the MARS MINI V2 is the parachute system you cannot live without. Available with multiple options, such as a simple & easy DJI Phantom mounting system, a quick release option for transport & storage ease, and an all new auto deployment system, you will soon see the MARS MINI V2 is the platform of choice for all manners of light weight multi rotor systems. For the multi copter pilot in search of true peace of mind, the MARS MINI V2 ballistic parachute system is the perfect solution to bring your aircraft home safely, no matter what type of failure you encounter.